The Beauty Benefits Anti-Aging Pillow has been ergonomically designed to give you the most restful night's sleep all while helping to reduce the occurrence of sleep lines, wrinkles and morning eye puffiness that is caused by sleep position. This patented contoured design comfortably lifts and cradles the head and neck to make back sleeping more comfortable than ever before. For side and stomach sleepers, the pillow is equally effective because the dual crescent cut outs minimize the possibility of direct facial contact with the pillow. It's built in gentle elevation also helps to reduce morning eye puffiness. And finally, the pillow is encased in a satiny cover to help preserve the texture and style of your hair. What is the best way to use the pillow? How do I take care of the pillow? These questions will be answered below. Sleeping On Your Back: To use the pillow while sleeping on your back, place your head in the contoured center of the pillow. You'll find you can move your head slightly from side to side without your face making contact with the pillow. While your pillow has a gentle built-in elevation to help reduce morning eye puffiness, the makers of the pillow recommend using your Beauty Benefits Anti-Aging Pillow on top of another pillow for even better results. Sleeping On Your Side Or Stomach: When sleeping on the side or stomach, position your head comfortably at the edge of either C curve of the pillow. This will minimize the possibility of direct facial contact with the pillow. 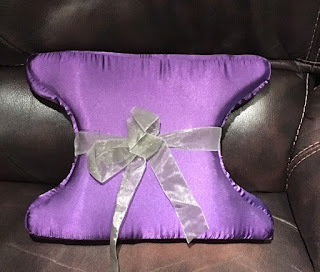 Adjustment Period: While you may find that you adapt to sleeping on your Beauty Benefits Anti-Aging Pillow right away, for others it may take up to a few days. Caring For The Pillowcases: By design, the pillowcase fabric is very delicate. The makers recommend that you hand wash the pillowcase using a small amount of gentle detergent or wash on a delicate cycle. Lay flat to dry the pillowcase. Caring For Your Pillow: Spot clean only using a gentle detergent. Never submerge in water. Allow to air dry on a flat surface. Here is how I found the pillow to be. So I have to sleep on my back or my side due to back surgery, having had vertebral discs L2-S1 fused. I try to sleep on my side as I find it the most comfortable. I cannot sleep on my stomach anymore, which really stinks because I was a major stomach sleeper for years. At first I thought I would give it a try on my back. I started using it and at first could not get used to cradling my head in the contours of the pillow. I knew I had to give it a chance though. It was also slippery, which I was not use to either. I did use the pillow on top of another pillow as recommended. I also made sure to have a pillow under my knee as recommended by my doctor. This side just did not work for me. I tried it for many days and did not get enough sleep. I got maybe 3-4 hours of sleep per night. So, I thought I would try it on my side next. Since I cannot sleep on my stomach, this is my only option left. I still kept another pillow underneath just in case. I cradled my head in the C curve of the pillow, at the edge so that my face was not touching any part of the pillow. Yes I did have a pillow underneath, but I think this was more for comfort and ease of use than to actually use it. My head made it to the pillow but not my face. That was fairly comfortable. Honestly more comfortable than having my neck laying the way it was on my back. I think I will stick to the side sleeping position. It is easier for me and I just feel more comfortable. I am very happy with the pillow. I have found that it does help keep my hair in a nice position and I do not wake up with any eye puffiness or "bed wrinkles". With extended use this pillow should be able to prolong the appearance of wrinkles on the skin and eye puffiness under the eyes. The Beauty Benefits Anti-Aging Pillow can be purchased at www,joyus.com. Register now and you can get 10% off sales of $50 or more, of which this counts. Like JOYUS on Facebook: https://www.facebook.com/hellojoyus; Follow JOYUS on Twitter:@joyus; Follow JOYUS on Pinterest:http://pinterest.com/hellojoyus/; Follow JOYUS on Instagram:http://instagram.com/hellojoyus; Follow JOYUS on Google+:https://plus.google.com/113426911937631298725 and Subscribe to JOYUS on YouTube:https://youtube.com/user/HelloJoyus.